Hatfield is a town in the English county of Hertfordshire, located 20 miles north of London. 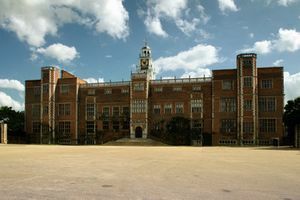 It is perhaps best known as the location of Hatfield House, an historic stately home with strong royal connections that include Queen Elizabeth I. It was formerly the base of De Havilland (subsequently taken over by British Aerospace) and it was at Hatfield that the Comet commercial jet plane was produced. The former runway is now a commercial zone, with roads named after planes produced by De Havilland. Hatfield is placed on the A1(M) road. Served by coaches such as National Express. It has good links with airports. Hatfield train station has links to London Kings Cross to the south and Stevenage to the north. UNO Bus which are operated by the university (they are pink and purple) serve the area and local community. Interesting places nearby include Ayot St Lawrence, the former home of George Bernard Shaw, and Hertford the county town of Hertfordshire. This page was last edited on 17 June 2016, at 22:03.